Turnout in American elections has remained abysmally low for decades, suggesting some degree of either apathy, suppression, or both. Even Americans who do vote often overlook a litany of further opportunities available to those who pursue them. Letters from individual constituents are most effective when combined with other strategies. One source of guidance to many nascent activists has been the Indivisible guide, which emphasizes constituent communications to Members of Congress. It was compiled by congressional staffers whose suggestions aim to replicate the direct engagement of Congress successfully promoted by Tea Party networks that have shared EFF’s transpartisan concerns about, for instance, mass surveillance and the threat it poses to democracy. To their credit, the Indivisible guide's authors acknowledge that their guide “is not a panacea, and it is not intended to stand alone.” While important, letters from individual constituents are most effective when combined with other strategies. Contacting an elected member of Congress represents an important act of political expression. Even when taking the time to write letters, however, individual constituents can be disregarded, or engaged in passing without commanding attention. Many who do gain the attention of their elected representatives’ offices receive only a form response. Support from at least three (and ideally half a dozen to a dozen) neighbors who co-sign the letter, identify themselves as constituents living in that office's legislative district, and attend the meeting together. Are you part of a community group that gathers to examine the issues and write letters together? Letter writing events can become infinitely more influential when participants simply sign each other's letters, so that they reflect—and are received as indicating—dissent not just by an individual, but rather by an organized group of constituents. To expand its reach, a grassroots group can easily direct letters not only at its Member of the House of Representatives, but also two U.S. senators, as well as members of the state legislature. It takes only five people writing one letter each to meaningfully raise a shared concern across those layers of federal and state representation. Groups of more than five can also reach elected officials at the municipal and the county level, where policy opportunities are most fluid and potentially transformative. Even letters written on behalf of groups remain generally private communications. Escalating pressure on elected representatives requires taking one's concerns to the public sphere. One way to express public dissent is to write and submit an op-ed for publication in a local newspaper. Concise, persuasive, forceful writing of 700 words or fewer can often interest editors seeking commentary to share with a broad audience. Whether or not an op-ed submission is published by a newspaper, social media or outlets like Medium.com can offer an alternative platform for publication. Finally, groups of constituents can sometimes meet a newspaper's editorial board to educate editors who write their own columns. 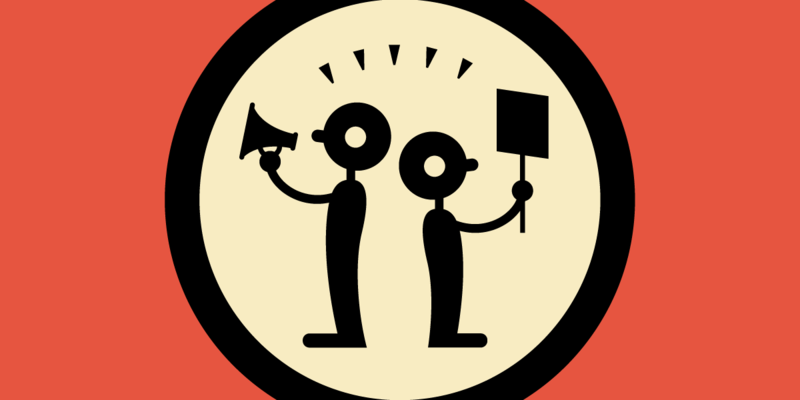 Beyond press–based public dissent are any number of event–based alternatives, from expressive events like rallies, marches, and protests, to educational ones like teach ins, public discussions, or debates. Even seemingly recreational events like concerts or parties can prompt a public discourse if organized to emphasize substantive themes. Finally, creative visual stunts, like flash mobs, light brigades, and banner drops—especially when amplified through social media—can offer groups with relatively few participants the chance to reach large audiences. Events educating a public audience can shift the ground beneath an elected official and ultimately offer more influence than requests or demands made directly to their offices. Training is available for any of these tactics through the Electronic Frontier Alliance, a network of local grassroots groups across the U.S. that remotely convenes each month. Any network of neighbors who share concerns about digital rights is welcome to explore and apply to join the EFA. The Alliance offers groups that join access to EFF supporters in their own areas, other grassroots organizers elsewhere, and EFF staff available to provide policy or organizing guidance on request (including a sample letter seeking a meeting with a congressional office). Materials are currently under development offering detailed guidance on various campaign models, from hosting digital security workshops, to seeking legal restrictions on mass surveillance by local police. Throughout the year, Congress takes occasional recesses, when lawmakers return to their states and districts. During these periods, congressional delegations are most accessible to constituents—and more vulnerable to their criticism. The Senate and House calendars include information about in-district work periods, one of which concludes this week. Share your reasons for wanting transparency, oversight, and meaningful limits on NSA mass surveillance.